Guys, are you interested in Vandy Vape Pulse X Squonk Kit? 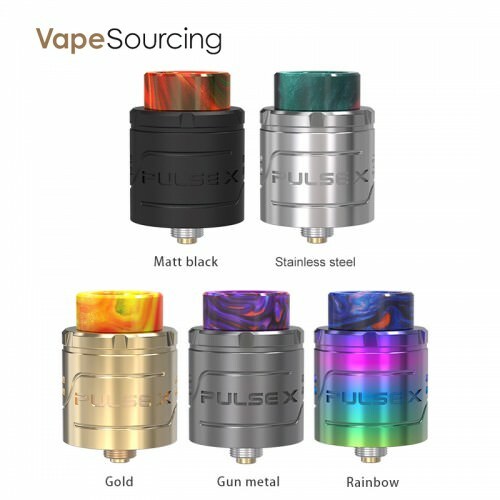 Here also comes Vandy Vape Pulse X BF RDA if you don’t need the full kit and just love the RDA. Vandy Vape Pulse X RDA 24mm is a 24mm diameter amazing RDA which is cooperatively designed by Toby.B and Vandy Vape. Constructed by high-quality stainless steel and good CNC laser cutting, it features both vertical building and horizontal building of dual coils with the X-style build deck, just like its name X, which makes it easier to install coils and tighten screws. Moreover, it also adopts top squonk feed and bottom e-juice return, which means there is an e-juice tube in the middle, the e-juice from the bottom can flow up and drop down sufficiently saturating cotton. With its 2ml well and six adjustable airflow holes in two side rows, it will bring you large, dense and tasty clouds. By the way, a stainless steel cap and a PC frosted cap are included in the package. 5 colors are optional.